It's best when dealing with several clients, products, and creative materials. When dealing with a high volume of creative materials to be trafficked to several different networks, I'd recommend Adstream. I have found this system is suited very well to any type of organization setup. Layout options and editable layouts. Many newsletter options we tried didn't have too much capability for layout, which could be fine for e-commerce but not for publishing. Clear reporting on the dashboard, and per newsletter sent out. Pricing: the only option we found that charges for emails sent vs. subscriber base. As we do not send emails every day, just once a week, we felt unfairly priced at our send rate with many competitors. Automation - good start, but the system is limited and clunky. If & else work, but other common constructs are missing. I personally am not involved in the decision to renew the product, but I had only positive experiences with the product and thus would recommend its use and renewal. I am a web designer and systems admin. I have not found anything with this system that was hard to use. Other systems make it hard to do simple tasks and is very limiting. SendinBlue doesn't limit you. I have never had any planned outages in the time I have been using the software and have had no issues with accessing it. Everything loads very quickly, it saves as you go along so you're unlikely to loose work if your computer fails. Reports are there immediately too so you're able to act quickly on customer engagement. I had contacted customer support regarding adding extra credit to my account. I was able to get a response within 24 hours from someone who knew what they were talking about. If you follow all the steps of the setup process they give you, any one can set this up in about 1 - 2 hours. I haven't used other products that are similar to Adstream. MailChimp was much more costly than SendinBlue. We have a database of aorund 20,000 emails across 3 websites which came to around £110 per month with MailChimp. Because Sendinblue works off email credits, we were able to reduce our spend to £30-£40 per month depending on how many emails we send.SendinBlue does have a few less features than MailChimp but those are probably more suited to full Marketing Teams that require a deeper insight into customer activity, whereas I am the general website manager who wouldn't have the time, or need, for deeper knowledge with a email database of our size. They have multiple options for upgrading bigger senders or if you need more emails sent in a month. Send in Blue has had a positive impact on our ROI with increased sales. SendinBlue has saved us £70 per month from £110 with mailchimp to around £30-£40. SendinBlue pricing is based on the number of email messages sent, rather than the number of contacts you keep in your account. 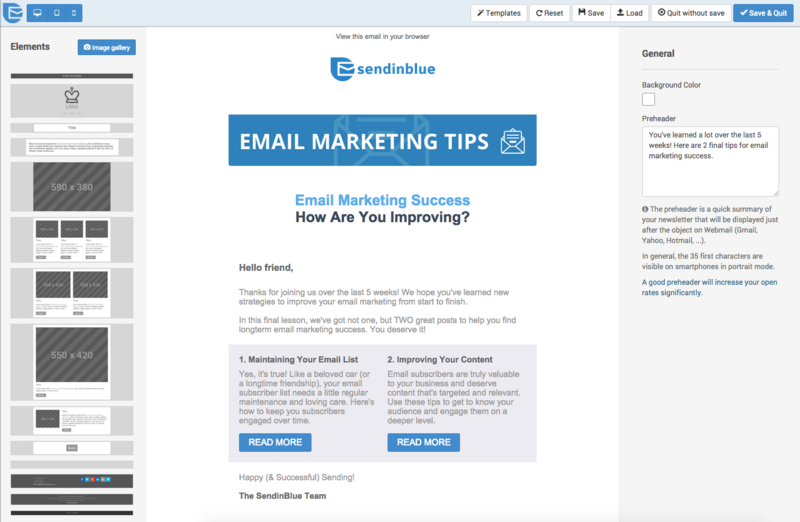 Try SendinBlue with a free account and send up to 9,000 emails per month (300 emails per day). As your business grows, you can upgrade to a plan that meets your needs without breaking the bank! Send up to 40,000 emails per month for just $7.37 -- or send even more emails at great prices.